Kips Bay Palm Beach, whose proceeds benefit the Boys & Girls Clubs of Palm Beach County, unfolds at Villa Belmonte. Open every day through December 19th. It is a quirkily architected beauty originally designed by Homer Guy for a young family in 1925 and later modified and enlarged. As it stands now, the multi-level house, with two main staircases and rooms that shoot off in all directions, meanders in a way that makes a guest feel like a true explorer. The rooms are exquisite, with narratives thoughtfully composed and elements dutifully gathered and assembled just so by a mind-blowing roster of top designers mostly based in Florida, New York, Atlanta and Chicago. No lack of inspiration, for some reason (perhaps, over-saturation!) I had writer’s block when I sat down to write this blog, and it was driving me bonkers! After a couple of false starts, I decided in the 11th hour to take a deep breath and start over and focus on the journey to design greatness because it takes a village to install a show house. And it is rather dramatic to see a space transform. I scoured some of the designer’s Instagram accounts to find evidence of "process" and I asked others to send me what else they had from behind-the-scenes at Kips Bay. Both tactics reaped real-life, behind-the-scenes images that I am re-sharing because they are simply awesome. This is where I like to start. At the beginning ... or close to it. And I hope you like it too. For Ellen Kavanaugh’s Tassel Lounge, artist Phillip Estlund known for decoupaging Eames style chairs with nature’s bounty, worked his magic on the walls. I love seeing him stepping back and assessing the progress. Hail to the wallflower! Before Matthew Quinn redesigned the kitchen, it was a dark and disharmonious space with too many points of egress. When he was done it was an architecturally pleasing square space with a strong axis and connection to the adjacent rooms, but with fewer openings. And it also had a Quintessentially Teal La Cornue range. Not for the faint-muscled, putting a completely new kitchen into place requires a good deal of strength. 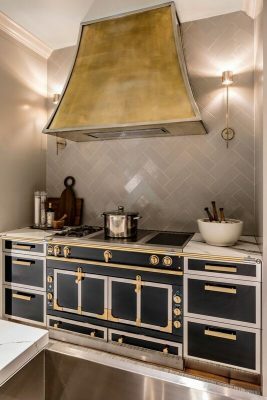 From hoisting cabinets to mounting countertops, and installing massive appliances, a small army teamed up for Matthew Quinn’s heavy-lifting kitchen install. 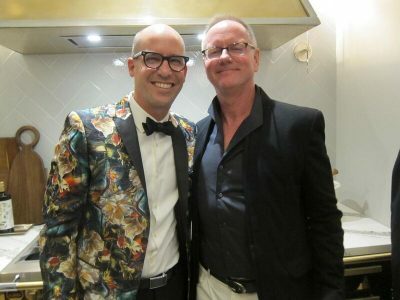 And when it's all done, Matthew (above) and his partner Ric Parrish, co-owners of Design Galleria, clean up rather nicely! To ensure that their Den Domestique would feature pretty pet portraits, Foley & Cox gave a holler on Instagram asking friends and followers to submit pictures of their best friends. Their photos were selected, printed and framed to form the ultimate awwww-inspiring salon-style wall in the most pet-friendly room ever. The backdrop for Philip Gorrivan’s Living Room is a Florida landscape mural completed in about 300 hours and by 4-5 artists at MJ Atelier, an LA-based bespoke art studio. Upon the painted surface, they integrated Florida-indigenous flora and fauna as hand-raised plaster. Each 11’ canvas was cut to fit each wall, mindful of doors and windows, rolled and shipped to West Palm, and seamlessly installed. Demo, electrical rewiring, and drywall patching were all part of the work before Lisa Erdmann could get to the pretty sunshine-y bedroom lounge. From different vantage points in the house, Erdmann’s room radiated with warmth providing an undeniable burst of happy. In Stephen Mooney’s intimate home library, wall-to-wall carpeting provides the proper acoustics and elegant barware offers the perfect vessels for libation in the libes. I love this shot of Mooney doing his Christofle prop shopping. Joseph Steiert worked late into the evenings silver-leafing the ceiling and painting delicate golden palm fronds on every wall of Caroline Rafferty’s glam-appointed master sitting room. Design Associate Matthew Martin shared the shot of Steiert in action as well as the in-house sketch (which we featured as the lead photo for this blog). “Most of our drawing in relation to the project was done to communicate ideas to each other as opposed to a client so they're a bit rough,” he told me. I just want to cut the drawing out, tape the paper walls together, and put the model room on a shelf for safekeeping! Amanda Lindroth envisioned reinterpreting an old slat house as a more refined Orchid House. Her transformation of the sad space included rounding doorways, adding wainscot, and overlaying trellis from Accents of France that was installed in record time. To achieve an elegant timeworn Palm Beach palette, she custom-specified the paint to the perfect washed-out pink and green. Twenty-one wall brackets later, Lindroth had created the perfect home for a stylish horticulturist. Another case of painfully stunning hand-painting occurs in the powder room designed by Tom Konopiots and Michael Stornello, principals at Vincere. They collaborated with DeGournay to create this shimmering blush tropical scene inside a meticulous jewel of a space to powder one’s nose. And then there are the swatches/project boards belonging to Christopher Maya, McCann Design Group, and Susan Zises Green. And with that I say, if you are anywhere within a few hours of West Palm Beach up until December 19th and love interior design, color and decorative painting, you should do your best to plan a visit. For more info on Kips Bay Palm Beach at 196 Belmonte Road, click here.